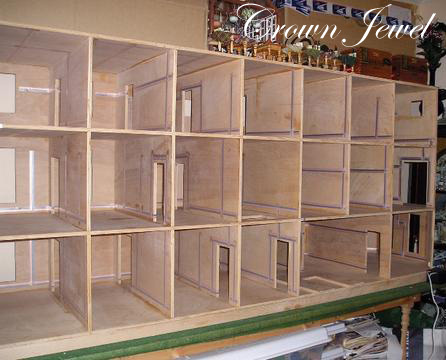 Specializing in turning miniature ideas into AMAZING realities! Welcome, friends! Come right in and step back in a time where beauty ruled the eye and grace eased the heart! Crown Jewel Manor was built in 1994 by John DiMenna, of Stratford, CT. It is constructed of cabinet grade birch plywood with glass windows from Lawbre. 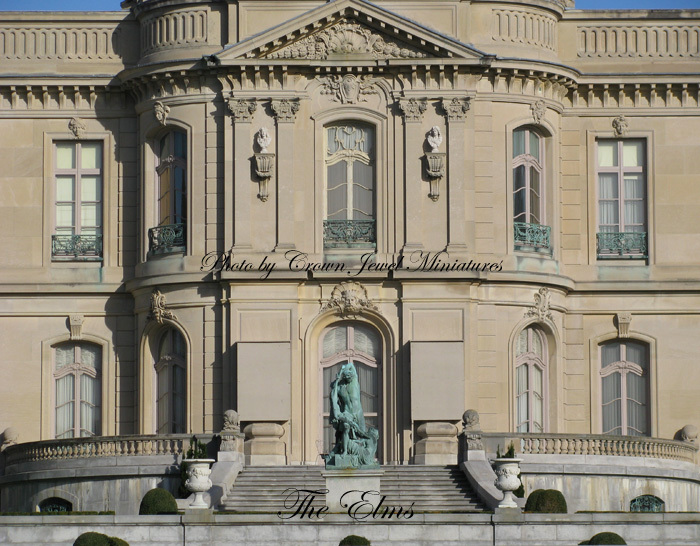 The exterior of the manor was inspired by The Elms, the summer residence of Mr. and Mrs. Edward Julius Berwind of Philadelphia and New York. In 1898, the Berwinds engaged Philadelphia architect Horace Trumbauer to design a house modeled after the mid-18th century French chateau d'Asnieres (c.1750) outside Paris. The interiors and furnishings of The Elms were designed by Allard and Sons of Paris and while I did not follow through with such lofty aspirations for my interior, many of the rooms in Crown Jewel Manor are arranged enfilade, meaning you can stand at one end of the house and look down through a succession of connecting doorways to see clear to the opposite end! 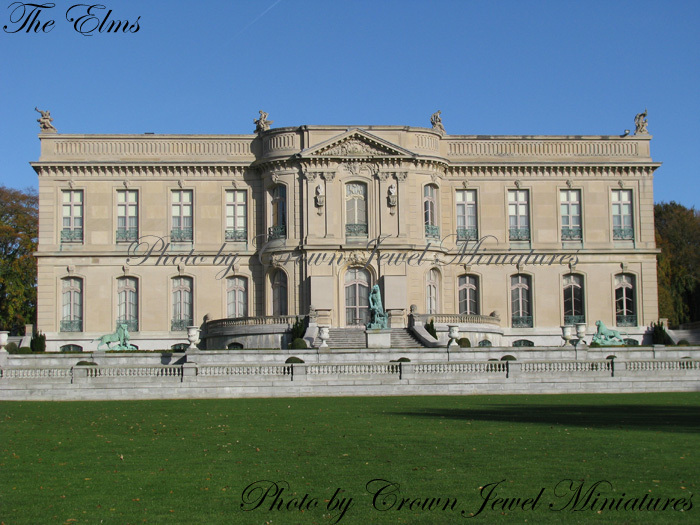 The Elms is located in Newport, R.I. Crown Jewel Manor is located in my living room and is something of a landmark there due to its size, as you might imagine. The exterior is finished, and photos will be added soon. The interior boasts twenty-one rooms but most are still under construction. All rooms have been wired for 12-volt electricity and some lighting has been installed. The walls have been primed, papered and finished with a variety of mediums to achieve various styles. Almost all floors have marquetry features and are mostly wood although tile and other finishes have also been applied. 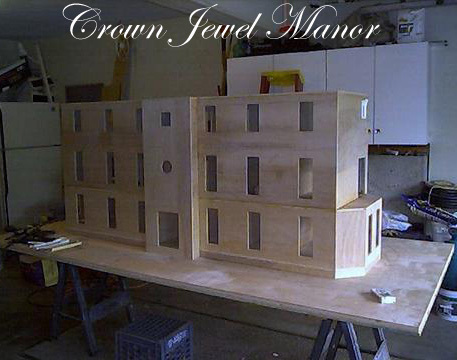 It is my hope that Crown Jewel Manor will inspire other miniaturists. Trust your imagination and build your dreams! I do not consider myself a professional, but with a little inspiration and a lot of effort, you too can build an heirloom. Feel free to contact me with questions and comments! Only through the art of sharing can we turn miniature ideas into life-like realities. Crown Jewel Manor is my private collection of a miniatures. I have posted these photographs as inspiration to other miniaturists and to show my work. At this time I do not build or furnish dollhouses but your feedback is very welcome! Please visit the Contact Me page. All photos are the copyrighted property of Crown Jewel Miniatures and may not be copied, saved or shared without my express, written permission. Copyright 2010 Crown Jewel Miniatures. All rights reserved.